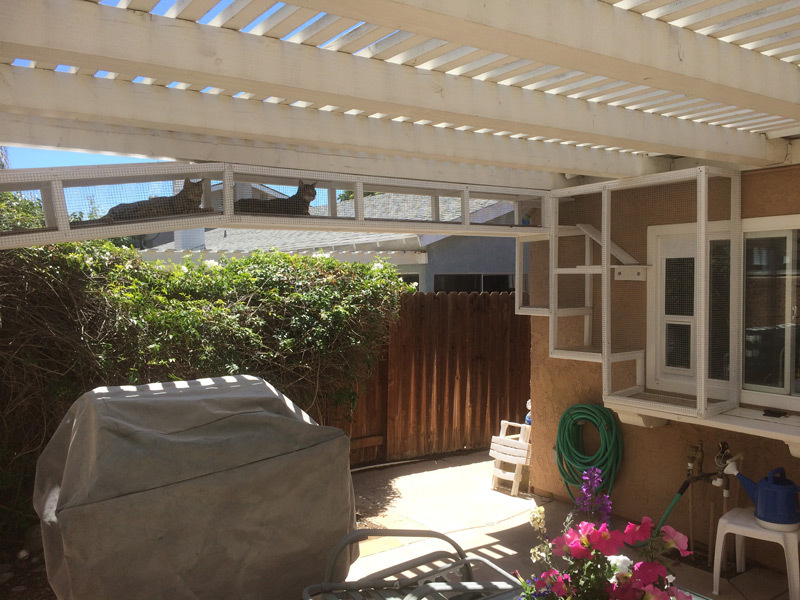 The Catio Is a Patio for Your Cat Because You Win, Cats. You Win. “They want to be up high, they want a bed to lay in and they don’t need a lot of space. They don’t need to run around like a dog. They chill,” he says, lingering on the word. 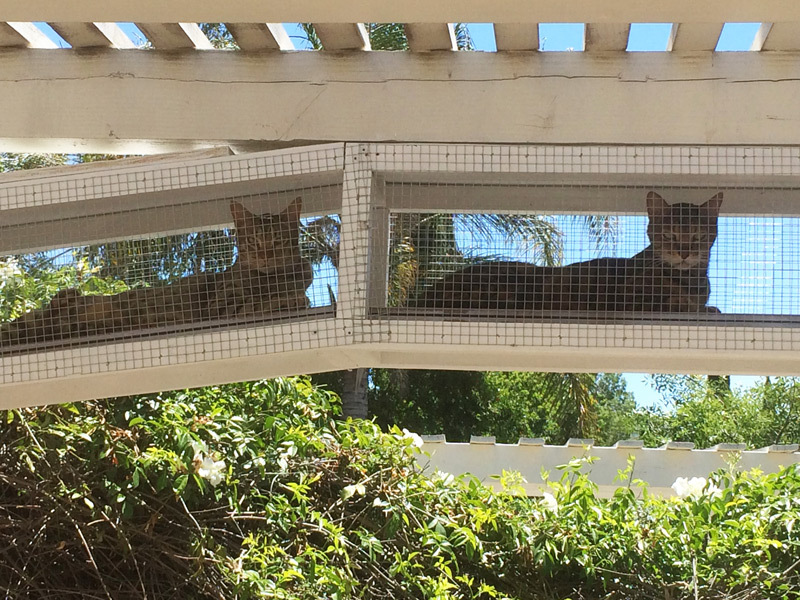 The catio is the latest craze among cat owners (or rather, the people whom cats deign to live with). 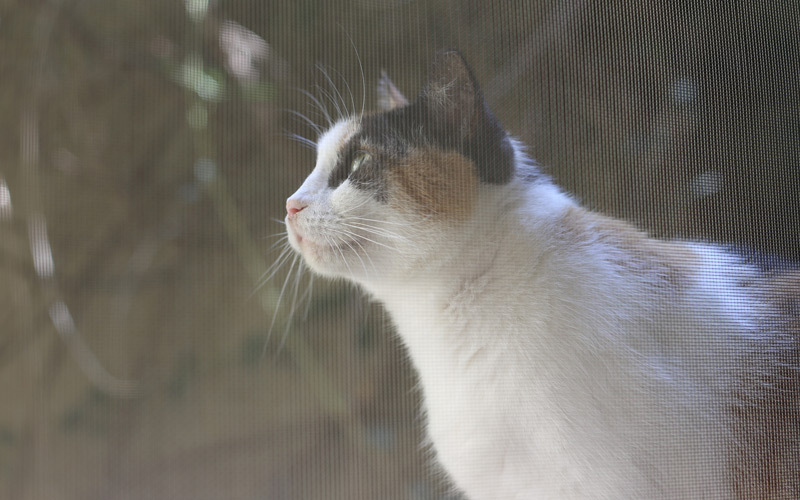 Your typical catio is a screened-in, protective enclosure that affords cats some of the excitement of being outdoors–bird watching, sunbathing–without the dangers of coyotes and cars. Ranging in style from the most basic, box-shaped shed, to multi-tiered, mini-homes nicer than your first apartment, catios have shelves, beds, tunnels, and if the cat’s into it, even room for a human. 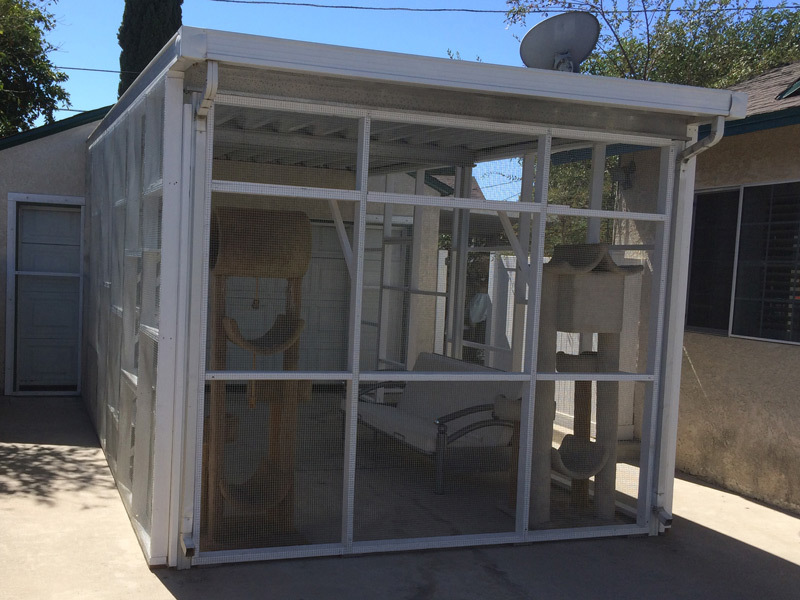 It’s possible to buy a pre-fab catio for a few hundred dollars online, but Preston, who is based in Palm Springs, seems to be cornering the market on custom catios all over the Southland. Using an impenetrable mesh called “hardware cloth,” he constructs them exactly to you and your cat’s specifications. 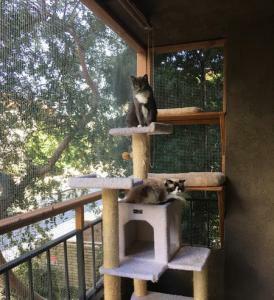 After a career in landscape architecture, Preston fell into the catio business by accident when an animal-loving friend of his wife’s asked him to build a catio for rescue cats she was fostering. “I had no idea what she was taking about,” he says. But he gave it a go. After that first catio, word spread. “Then another person wanted one, and another person wanted one …” and the reign of the Catio King began. 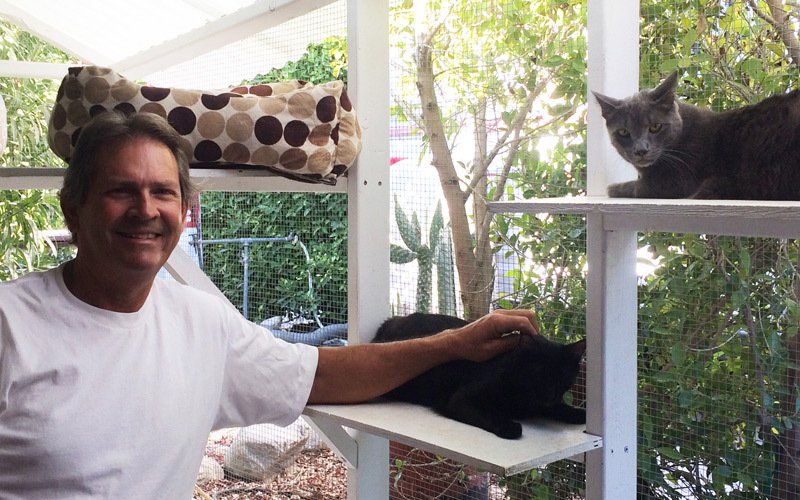 Preston has designed catios of all shapes and sizes for cats from San Diego to Sacramento. They start at around $1,500, and every one is a little different, though for the most part they’re pretty simple. “I don’t do elevators or anything like that,” he says. But he did construct a tunnel for one client, running from the house to a freestanding catio in the yard. The cats were pleased. “They hang out in the tunnel more than anything,” he laughs. What if you buy a thousand-dollar catio and your cat never goes inside? Preston says that’s never happened. “You don’t get a refund,” he says. Preston suggests discussing catio construction plans with your cat ahead of time.